Holi never simply meant to be just festival of colours; its purpose is deep and spiritual. It reassures the people of the power of the ‘truth’ as the moral of the story. It is marked by religious zeal and social merriment, indicating a cyclic process of human existence in which the old is washed off while the new is welcomed gaiety. The legend of Hiranyakashyap (devil and powerful king) and Prahalad (true believer & devotee of lord Vishnu) points to the fact that extreme devotion to God pays as He always takes his true devotee in His shelter; thereby ensuring victory. 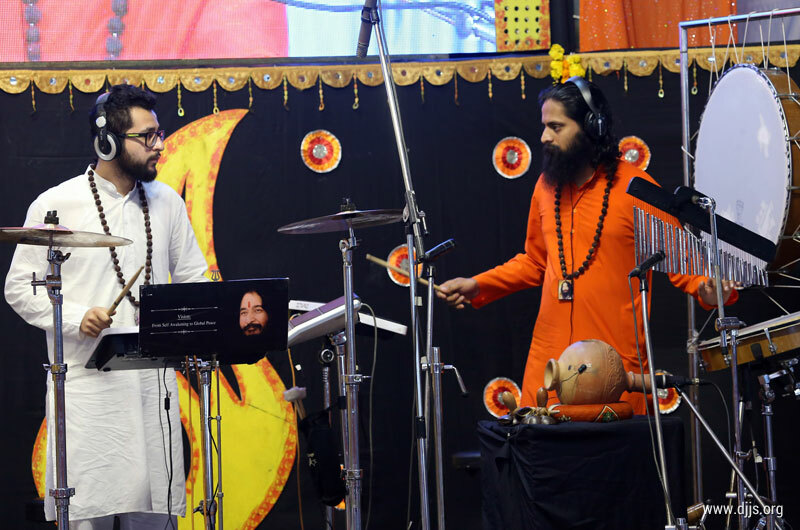 Divya Jyoti Jagrati Sansthan (“DJJS”) under the divine guidance of Shri Ashutosh Maharaj Ji (Head and Founder – DJJS) is working to attain mission of uniting globe by providing them a recipe of mental peace in form of “Brahm Gyan”. Taking initiatives in this direction, DJJS organized monthly spiritual congregation at Divya Dham Ashram, New Delhi on 4th March, 2018. The attendees reserve a special space in their hearts for the Monthly Congregations and await it all month long. It enriches all hearts, thereby enabling them to set out to achieve even more. The spiritual discourser of the program, profoundly and proudly claimed the greatness and worthiness of the spiritual journey, which is the sole purpose of the human life. Where our devotion to the world, squeezing out our energy, leaves us frail and weak, our devotion to God revitalizes us while refilling us with new vigour and energy. Supreme Devotion is the divine act of channelizing our thought-flow. Worshipping the Guru holds a great importance in the life of a disciple. The communion with God, involving constant remembrance, makes a man all the more powerful while imparting him the spiritual power, thus making him strong enough to face all sorts of tribulations and responsibilities, whether physical or mental or spiritual. The assuring and engaging discourse injected the colours of determination whereas the mesmerizing musical performances infused the blends of will power into one and all. Each tune played there touched the attendees’ hearts individually, often rolling tears out of their eyes or driving their feet to dance. To fulfill their duty, the disciples attending the Monthly program vowed to devote themselves in entirety not only to their Master but also to His grand mission. The session concluded by organizing banquet for the large number for devotees.